Lenox Hill Radiology (LHR) | East 66th Street (formerly Manhattan Diagnostic Radiology) is part of the Lenox Hill Radiology network of 25 outpatient medical imaging centers in the New York metropolitan area. 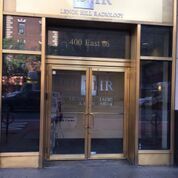 Lenox Hill Radiology at East 66th street (at the corner of 1st Avenue) in Manhattan is a full service imaging center offering an array of imaging services including, . Lenox Hill Radiology | 66th Street centers offers 3D mammography, the latest technology in breast cancer screening. Studies show that 3D mammography detects 40% invasive cancers than traditional mammography alone. So when it’s time for your annual mammogram, trust the experts at Lenox Hill Radiology to deliver quality results and compassionate care. Located in Midtown east side Manhattan on East 66th Street, Lenox Hill Radiology is easy to get to by train or bus. By train, take the 6 train to 68th Street. By bus, take M15 and M66 bus to 67th Street at 1st avenue. Lenox Hill Radiology is conveniently located near several area hospitals. The imaging center is just a half a mile from Lenox Hill Hospital and New York Weill Cornell Medical Center and 1.5 miles from Roosevelt Hospital. Students at Rockefeller University can easily walk to Lenox Hill radiology at 66th Street, located at just 0.1 mile away. Lenox Hill Radiology provides a full spectrum of state-of-the-art diagnostic imaging services in a caring and comfortable environment. You can count on Lenox Hill Radiology to provide exceptional service and timely and accurate imaging reports. This outpatient radiology center offers a great location that is easily accessible to patients, whether walking or taking the train or bus. Please contact us to learn more about our radiology exams, subspecialty imaging experience, as well as our convenient appointment times.